Discover the magnificent scenery of the green north of Spain on a 4-day tour of San Sebastian, Santander, Bilbao, Oviedo..departing from Madrid with a bilingual guide. 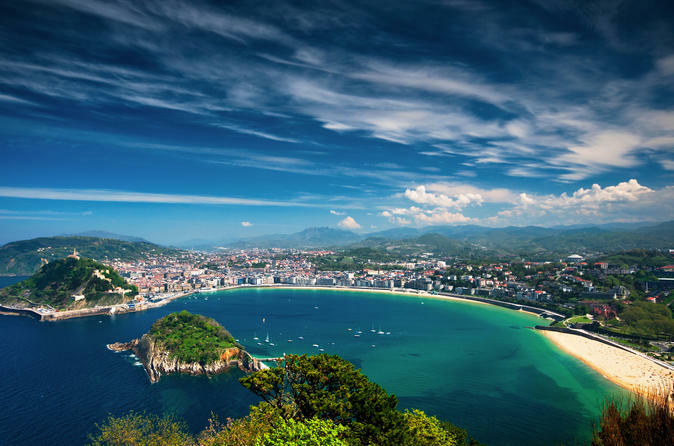 Travel in an air-conditioned vehicle through Zaragoza and spend 1 night in San Sebastian enjoying a panoramic tour and discovering the famous Concha Beach. Afterwards, know Bilbao and Castro Urdiales on the way to Santander. To end depart to Oviedo in Asturias, but first enjoy Santillana and Covadonga in Cantabria region. Conclude your excursion with a stroll around the city of Salamanca. Departure from JULIÁ TRAVEL bus terminal, located in the underground parking of the Plaza de Oriente at 08:30 a.m. Towards Zaragoza. Free time to visit the Basilica of Our Lady of The Pilar, patroness of Hispanity and stroll through the old streets of Zaragoza. In the afternoon we will continue to San Sebastian, it’s one of the most famous tourist destinations where they hold the International Film Festival. Panoramic city tour of this marvel style bourgeois city, seeing the extraordinary landscape dominated by the bay and the magnificent La Concha beach. Accommodation. Breakfast at hotel. We will approach Mount Igueldo, to contemplate the marvelous views of the city and then proceed towards Bilbao. Panoramic drive to Bilbao and free time on the esplanade where The Guggenheim Museum is located in order to admire this modern arquitectural building. Proceed to the old fishing village “Castro Urdiales”. Free time. Departure to Santander, a port city located between the sea and the mountains, well known for its Sardinero Beach, one of the best known beaches in Spain. Free time to stroll through this elegant city. Accommodation. Breakfast at hotel. Departure to Santillana, it’s one of the most important historical artistic towns in Spain. It contains architectural treasures such as the Collegiate of Santa Juliana, a Jewel of the Romanesque Architecture in Cantabria. Continue to Covadonga, where you will have free time to see the Sanctuary and the Grotto where you will see the patroness of Asturias our Lady of Covadonga. In the afternoon, departure to Oviedo, where you will see on a series of hills the beauty of Saint Maria de Naranco Church, Jewel of the pre Romanic Austrian architecture. Free time to explore Oviedo, many of their streets are pedestrian, where you will be able to see World Heritage sites like The Cathedral, a splendid example of Gothic Austrian architecture. Accommodation. Breakfast at hotel. Departure to Salamanca. Short stop and free time in this university city (World Heritage) of great architectural and artistic wealth. Continue to Madrid. END OF OUR SERVICES.